We are offering more varieties this year than ever before. All varieties in limited quantity. First come first served. 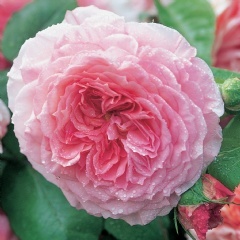 English Country Gardens will offer the following David Austin Rose as part of our Spring product line. Plan your space now to begin or add to your collection of David Austin Roses, the finest English Roses available. Credit is given to David Austin Roses for the description and history of these fine offerings as listed below. 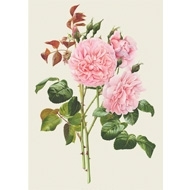 We are very excited to be offering David Austin Roses again in our product line for Spring. As always, availability is dependent upon weather and demand. We can not reserve particular roses for you but we will be happy to let you know the availability of any particular rose on any given day. 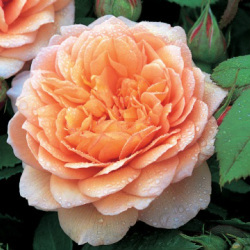 English Country Gardens selects David Austin Roses we feel will provide our customers with the greatest possibility for success while also considering all of the factors of our Mountain climate including wet cold winters and hot humid summers. 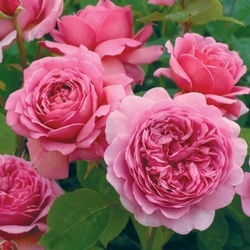 If you have found particular success with a David Austin Rose, we would enjoy hearing from you. Please e-mail us at EnglishCountryGardens@windstream.net Photographs included in your e-mails will be considered for our "Customer Photos" page. In early summer, 'Abraham Darby' bears large, deeply cupped blooms in shades of pink, apricot and yellow and, in spite of their size, they continue to be produced for the remainder of the season. They have a rich, fruity fragrance with a refreshing sharpness. 'Abraham Darby' is an excellent, vigorous, medium-sized shrub. It has a bushy, arching habit and large, polished, rather modern leaves; flower, growth and leaf are all in proportion and never clumsy. Named to celebrate the inventor Abraham Darby, who, with his son and grandson, played an important part in the industrial revolution. It repeats well but summer pruning will encourage a better crop of flowers and help maintain a more compact plant. Large, many petalled apricot blooms. Superb myrrh fragrance with floral and honey character. A healthy, vigorous short climber. Good repeat flowering. 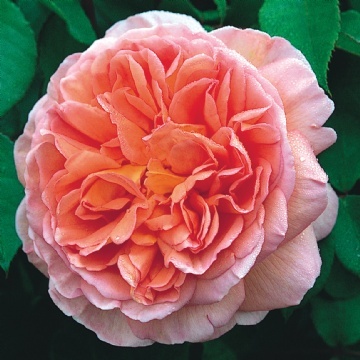 Here is a variety of unusual colouring for an English Rose - strong salmon-pink that changes with age to a particularly strong shade of pure pink. Deeply cupped flowers gradually develop into an open, slightly cupped rosette. Benjamin Britten is a useful rose to provide a highlight among the softer shades of most English Roses. It is of medium height; vigorous, with dense growth and excellent foliage. The fragrance is intensely fruity, with aspects of wine and pear drops. Named to commemorate the life and work of the famous English composer, conductor and performer. The flowers are a pure shade of rich rose pink that pales only slightly in the sun. They are shallowly cupped, very fully double with a central button eye and are held attractively above the rounded bushy growth. It is very healthy. It would make an excellent choice for rose beds and borders, mixed in with perennials. With its neat bushy habit and excellent repeat-flowering it would also make a superb hedge. There is very good Old Rose fragrance. Bishop’s Castle is a small town. A castle was built there in 1087 to protect the English border. A flower of beautifully mixed shades of pink, apricot and yellow, overall, giving the impression of rich apricot. 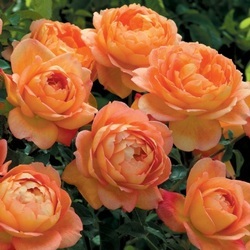 At the bud stage, when the petals are just starting to unfurl, the inside of the petals are a very rich, deep apricot, as opposed to the paler, soft yellow undersides. When fully open, the center of the flower is well filled with petals, their closeness giving the impression of a rich, apricot - pink. 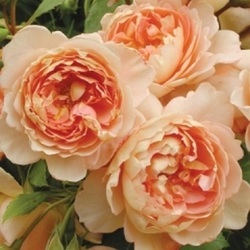 Around the center, the loose ring of petals curl in slightly and so show their pale apricot yellow undersides. It will quickly make a lovely, bushy, rounded shrub with quite straight stems, the many flowers nodding just slightly. There is a strong and beautiful myrrh fragrance. Carding Mill is an extremely beautiful valley in the Long Mynd just to the west of the David Austin Nursery in Shropshire (David Austin 2004). Exquisite flowers of a soft yellow color. The blooms start off beautifully cupped, later opening out to form a rosette shape. Each bloom is packed with numerous small petals, arranged around a classic button eye. All in all, one of the most beautiful of the yellow English Roses and also, for those with particular cold winters, one of the hardiest. Dedicated to Charlotte, who is one of David Austin's granddaughters. Very full, large rich yellow cupped flowers fading in color to lemon. The blooms have a strong and delicious fragrance that varies between soft floral Tea and lemon. A sturdy and very healthy shrub that has attractive bushy growth. There is something a little special about white roses - they are all purity and light - and yet really good white roses are rare among English Roses and Hybrid Tea Roses alike. This is because white roses are very difficult to breed. 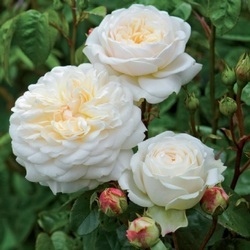 'Claire Austin' bears pleasingly cupped buds of a pale lemon shade which gradually open to form large, creamy-white flowers of typical English Musk delicacy; their petals perfectly arranged in concentric circles, with a few more loosely arranged in the centre. They have a strong fragrance base on myrrh with dashes of meadow sweet, vanilla and heliotrope. It forms an elegant, arching shrub with plentiful, medium green foliage. Strong and particularly health. Undoubtedly our finest white rose to date. Claire Austin is David Austin's daughter. She has a nursery which specializes in hardy plants, including the UK's finest collection of irises, peonies, and day lilies. 4.5 x 4ft or 8ft as a climber. Glorious neatly formed rosettes of a lovely apricot-orange with a strong, fruity fragrance. Well-rounded with slightly arching growth. Good red roses are never easy to breed, so David Austin was particularly pleased to introduce Darcey Bussell as they believe, and we agree, it is one of the best and most healthy red roses bred to date. Its beautiful flowers are produced freely and with excellent continuity. When young, their outer petals form a perfect ring around an inner cup; gradually opening out to form a perfect rosette. The colour is a deep rich crimson that takes on a fringe of mauve just before the petals drop. 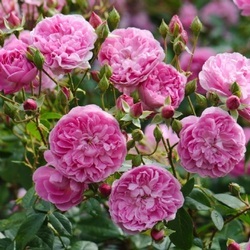 This rose, with its short bushy growth, is an excellent shrub for the front of the border or for planting in formal rose beds. It will make an excellent plant for a large pot. It is David Austin's first fully double crimson to be released since the best selling William Shakespeare 2000 and is perfect for gardeners who would prefer a more compact shrub. Darcey Bussell is the highly acclaimed ballerina. She was appointed principal at the Royal Ballet at the age of 20 and has danced in the title role of many ballets around the world. She has been honoured with many awards including the OBE. Falstaff bears large crimson flowers with a shallow, cupped shape. They are of exquisite form and quality, packed with numerous petals which interfold at the centre. This helps to create a lovely glowing effect within an enclosed saucer of outer petals. The blooms are a rich, dark crimson colouring at first, eventually turning to a wonderful shade of rich purple. There is a powerful Old Rose fragrance. The growth is strong, bushy and rather upright, with the flowers nodding nicely on the stem. The foliage is quite large and rather modern in character. This variety is named for the well-loved Shakespearean character, who was the faithful companion of Prince Henry. If you want to grow this rose as a shrub it may benefit from summer pruning. This is one of the largest-flowered and most magnificent of the English Roses. Its color is rich golden yellow and the flowers are in the form of a giant, full-petalled cup. It has excellent shapely growth, forming a nicely rounded, slightly arching shrub with ample foliage. It is very reliable and easy to grow. An ideal rose to mark any celebration or important event. The flowers are initially Tea-scented but often develop a wonderful combination of sauterne wine and strawberry. May benefit from summer pruning in warmer areas. This variety was voted The Worlds Favourite Rose by members of the 41 National Rose Societies worldwide. It also won the James Mason Award from the RNRS in 2000. Named for one of the most influential gardeners of his time, Graham Thomas was a frequent visitor of the nurseries of David Austin and chose this rose himself. A tough little rose that bears flowers of the most perfect formation - shallow cups of the purest rose pink. These hold their form to the end; the occasional petal falling back to give a pleasing effect. The plant has an excellent bushy habit, maturing into an attractively rounded shrub with its flowers almost to ground level - a characteristic that is particularly favored at David Austin Roses. The young foliage is bronze at first, later becoming green - and the whole plant is of truly 'Old Rose' character. There is a strong, pure Old Rose fragrance that has been described as reminiscent of rose-based cosmetics. Harlow Carr is the newest and most northerly of the RHS gardens of the UK. A fine display of English Roses has been created there. Previously featured in the David Austin Wall Calendar. There are few roses as popular as those of deep crimson colouring – and none so difficult to breed. 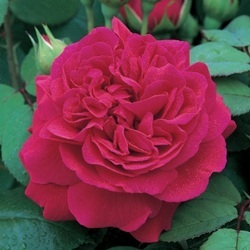 ‘Heathcliff’ is a beautiful addition to English Roses of this colour. It has large, fully double flowers of deep rosette shape. The colour is a deep crimson, with a certain softness that is reminiscent of some of the old red Gallica Roses. It is a healthy variety, with shiny, deep green leaves and rather upright growth. Its fragrance is most pleasing and rather unusual – basically Tea Rose with a mixture of Old Rose and just a hint of cedar wood. Distinctive soft lemon blooms pailing to cream. Extremely healthy and floriferous. Delicate apple fragrance. A sturdy, upright shrub. A superb, large shrub with long, slightly arching, almost thornless growth - typical of the "Leander" group. The colour is a lovely warm pink at the entre, shading to pale pink at the edges. This is a tough disease-free rose that is excellent for the back of a mixed border and can be trained into a wonderful short climber. The flowers are large and full, with many petals arranged in a neat formation. There is a medium old Rose fragrance. It was named in celebration of the 60th birthday of James Galway, the world famous flautist. Summer prune to maintain it as a shrub and encourage quicker repeat flowering. 5 ft x 3.5 ft shrub or 10 ft as a climber. 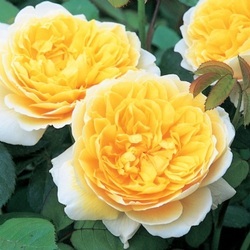 This rose was named to commemorate the Queen's Golden Jubilee. it is one of the finest roses introduced so far. Glorious blooms of tangerine-orange and yellow. A strong delicious fruity fragrance with hints of pear, grape, and citrus. Forms a fairly upright but bushy shrub that flowers freely. 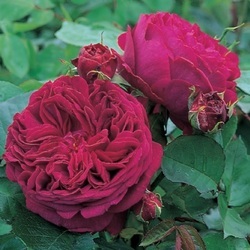 This rose promises to be one of the most robust and hardy roses in the David Austin Collection. It is also highly resistant to disease and it will bloom with unusual continuity throughout the season. Indeed it is an ideal rose for the inexperienced gardener. The young buds are a rich orange-red. These open to form chalice-shaped blooms, filled with loosely arranged petals. Each petal has a salmon pink upper side which contrasts beautifully with the attractive golden-yellow reverse. The chalice shape means that the undersides of the petals are clearly seen, revealing glimpses of the deeper colour in the heart of the bloom. There is a pleasant, warm, tea fragrance with hints of spiced apple and cloves. 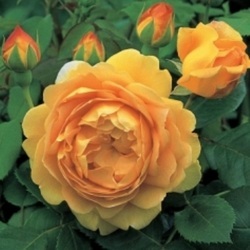 Lady of Shalott quickly forms a large, bushy shrub with slightly arching stems. The mid-green leaves have attractive, slightly bronzed tones when young. Named for the Tennyson Society. The name is taken from one of Alfred Lord Tennyson's favorite poems of the same name. In the poem, The Lady of Shalott lived in a castle close to King Arthur's Camelot and was held in a spell until she saw the reflection of Sir Lancelot in a mirror. 4 x 3.5 ft or 8 ft as a climber. We were pleased to introduce this rose, as nearly all rambling roses are once flowering, whereas this is repeat flowering. It sends long, slender stems to a considerable height, yet still finds the energy to flower again, blooming intermittently throughout the summer and into autumn. Small, fully double blooms of lovely soft yellow are held in medium to large clusters. Attractive polished foliage with small leaflets and few thorns. There is a light Noisette fragrance. It is exceptionally healthy. Winner of a Gold Medal the Presidents Trophy for best new rose and the Henry Edland Medal 2000 Best scented variety. Outstanding repeat. Particularly free flowering and reliable. Rich yellow rosettes. Very fragrant. Tree roses are budded at 3 feet. New deep crimson roses are always a welcome addition to a David Austin Collection. 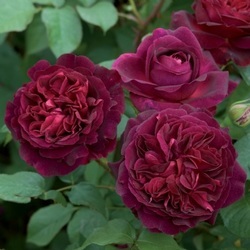 The flowers of this variety are in facdt light crimson in the bud but, as the centre gradually reveals itself, it becomes a very deep velvety crimson while the outer petals remain rather lighter in colour. They are of large size and cupped at first, becoming shallowly cupped with time. As the flower ages we get glimpses of the stigma and stamens amongst the petals. The growth is quite bushy, forming a broad shrub with good disease-resistance. The leaves are mid-green; the younger leaves being red-bronzed to form a nice contrast. There is a strong Old Rose fragrance with a fruity note. The fragrance expert, Robert Calkin, assesses this as warm and fruity with blackberry, blueberry and damson. Munstead Wood was Gertrude Jekyll's own garden in Surrey where she worked on her many gardening books. An Outstanding variety. Soft pink, cupped rosettes with a medium fragrance. A attractive, vigorous shrub that flowers early in the season and continues with great regularity. Exceptionally healthy. This rose was named for Princes Alexandra, who is cousin to Queen Elizabeth II. She is a keen gardener and great lover of roses. The rose that bears her name has usually large flowers of a warm, glowing pink. They are full-petalled and deeply cupped in shape, all enclosed in a ring of outer petals of a softer pink; creating a most pleasing effect. They have a delicious fresh Tea fragrance which interestingly, changes completely to lemon as the flower ages - eventually taking on additional hints of black currants. It is very healthy. An exciting development, stemming from an entirely new line in breeding. It has an overall character that is very different from any other rose we know, having its own very special beauty yet retaining the classic full-petalled flowers of an English Rose. The young flower is deep pink, almost red, gradually fading to a pure deep pink as the bloom matures. The undersides of the petals hae a pleasing hint of yellow. The petals are rather narrow and unusually substantial. The growth is upright and the foliage is rather thick, succulent, and highly polished.d Remarkably resistant to disease. It flowers over a long period and in large clusters; the individual blooms open in succession. 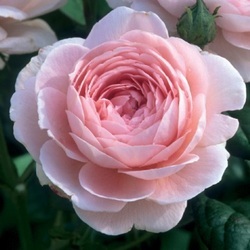 There is a Tea Rose fragrance of medium strength. 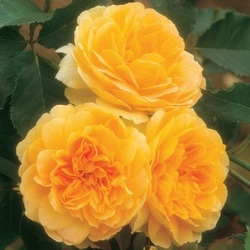 The compact, bushy growth makes this rose ideal for borders or it would be a great choice for hedging. Named after Her Royal Highness, the Princess Royal who is patron of Riding for the Disabled. The charity offers opportunities for therapy, achievement, and enjoyment to people with disabilities. The colour is the sofest glowing pink with hints of apricot. This is an excellent rose for bedding, boarders or for arrangement in the house. The flowers lasting several days in water. Very free-flowering peach colored blooms, produced almost continuously. Attractive, bushy shrub with few thorns. Lovely tea fragrance. The colour is a soft pink shading to a paler pink on the outer petals. There is a powerful fragrance - an outstanding example of the English Rose fragrance, based on the myrrh note introduced with 'Constance Spry'. Winner of the RNRS Henry Edland Award for Fragrance. Summer pruning will help to maintain the height and encourage quicker repeat flowering. 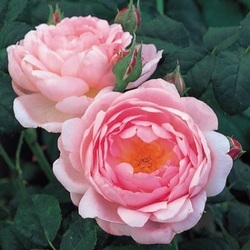 This free-flowering rose bears superb, pure pink cupped rosettes from early summer. A strong and delicious myrrh and heather honey fragrance. Vigorous, arching growth forming a splendid shrub. 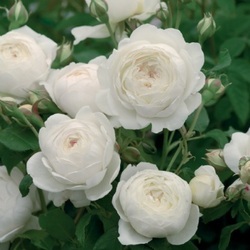 A delightful, unassuming rose that is completely free from disease and bears charming, pure white blooms. The Old Rose fragrance is strong. One of the first English Roses to flower continuing almost without stop until the end of the season. Extremely winter hardy. Bearing masses of beautiful large blooms almost continually through the season with a medium-strong myrrh fragrance. 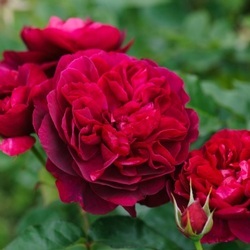 A vigorous rose, which is ideal for the middle or back of a border. 4 ft high x 3 ft wide. 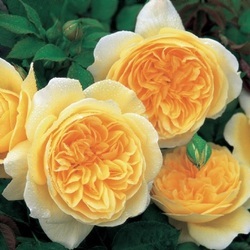 A yellow rose of delicate beauty; the flowers are of a particularly pleasing cupped formation. The centre petals are in the form of a rich, deep yellow cup, while the outer petals fall back and fade to palest yellow providing a most pleasing two-tone effect. A previous winner of the Henry Edland Medal for the best scented variety in the RNRS Trials and awards in other trials both in the UK and around the world. May need some summer pruning, if grown as a shrub. Bears large, bright crimson blooms. Beautifully formed; deeply cupped with loosely packed petals intertwined at the centre of each bloom. The petals eventually turn back to give a domed, less formal, but still attractive flower. They bend over with their weight to give an elegant effect. There is a pleasing old Rose fragrance. It is a good choice for cutting for arrangement in the home. It forms a healthy, medium-sized shrub with robust, bushy and spreading growth. The large dark green leaves complement the colour and size of the blooms perfectly. With its striking, crimson blooms it will make a very pretty sight both as a shrub and as a short climber, especially when fanned out to encourage maximum flowering. Its relatively compact growth makes it ideal for growing against an obelisk or on wall near a doorway. Named after the heroine of Thomas Hardy's novel. A dark crimson rose, with rather loosely formed flowers that open wide and hang elegantly. They have a special character of their own, reminiscent of the flowers of tree peonies, as sometimes depicted on fabrics and wallpapers. There is a light Old Rose fragrance. ‘The Dark Lady’ forms a shapely, bushy shrub with spreading growth. It is small at first but over time becomes quite large, reaching a medium height. It bears attractive, large, dark green leaves which are rough in texture, resembling those of its Rosa rugosa parentage. It is particularly happy in warmer, Mediterranean-type climates. The name is taken from the mysterious Dark Lady of Shakespeare’s sonnets. This variety is particularly happy in Mediterranean-type climates and in the southern USA. A rose of delicate charm - its flowers being beautifully formed; their color a soft glowing pink at the center, shading to palest pink on the outer petals. When the petals open they expose numerous stamens, providing an almost water lily-like effect. This rose would produce a wonderful effect towards the back of the border. It will also make an excellent climber. Like ‘Mortimer Sackler’, it is highly disease-resistant. An excellent pure yellow rose, that combines unusually strong and healthy growth with blooms of the utmost delicacy and charm. These are quite large and evenly shaped, with many small petals opening to form a flat flower. They have a softness of texture which is most pleasing, and look particularly fine when arranged in a bowl. Its fine fragrance is a perfect balance between a classic Tea scent and the English Rose, myrrh fragrance. The flowers are a beautifully rounded shape with neatly placed petals, making up a perfect rosette. The opening buds are lightly tinged with yellow but as the flowers open they become pure white. There is a light apple fragrance. The growth is upright, gradually curving outwards at the top to provide us with a good garden shrub which could, if desired, work equally well as a bedding rose. It has excellent vigor and is very healthy. It has typical light green Musk Rose foliage and its almost thornless. This is the most fragrant of this year’s new varieties and, indeed, one of the most fragrant of all English Roses. It has the distinctive myrrh scent which is rarely found in roses, appearing first in ‘Constance Spry’, and later in ‘Scepter’d Isle’. The plump buds have attractive flashes of red. 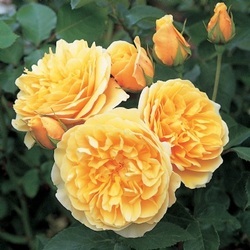 These open to form round, rich buttery yellow coloured blooms which eventually pale to a softer creamy colour. Even when the flowers are fully open, they retain their beautifully rounded chalice shape. It forms a particularly healthy and bushy shrub with many stems shooting from the base. It remains relatively upright and has few thorns. 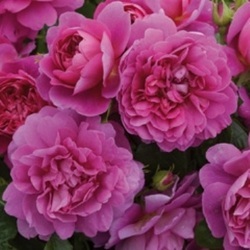 With its soft colouring ‘Wollerton Old Hall’ will very easily blend with a wide range of colour schemes, planted with roses or other shrubs and perennials. Its more upright habit makes it suitable for both formal and informal situations. It should be positioned where its strong scent can be easily appreciated. Wollerton Old Hall in Shropshire has one of the most beautiful private gardens in the country, not far from our nursery. The gardens are set around a 16th Century Hall and feature roses in creative plant combinations, including many of our own English Roses. Wollerton Old Hall is open to the public on selected days throughout the summer. All roses greatly appreciate a good fertilizer. Repeat-flowering varieties such as the English Roses need regular feeding to perform to their maximum. David Austin's organic based rose food is specially formulated to release nutrients over a long period. It will supply the three major elements of nitrogen, phosphorous, ad Potassium as well as a range of essential trace elements to ensure strong, healthy growth and abundant, fine quality blooms. David Austin's organic-based Rose Food is available at English Country Gardens in a 3 3/4 pound pouch. Simply follow the recommendations on the packet when using any rose food as excessive nitrogen can make roses more susceptible to pests and diseases. These instructions are a basic step by step introduction to enjoying wonderful roses. Keep your rose well watered until you are ready to plant. Choose a position with at least 4 hours of sun per day. If available, add some compost or manure to the soil. Remove your rose from its pot. Place the rose into the hole. Gently firm the soil with your heel. In areas with mild winters, prune in January or February. In regions with cold winters, delay pruning until spring growth is just starting. In the first year, cut the stems by approximately a third. In subsequent years, prune the stems by approximately half their original size. Don't forget to step back as you prune, to make sure you are creating an attractive, rounded shape. Reduce the previous year's flowering shoots by about 6 inches. Water until your rose is well established. A regular deep watering is much better than a daily trickle. 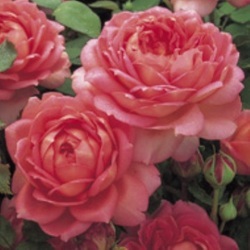 Feed once or twice during the summer with a good quality rose fertilizer; such as David Austin Rose Food. Throughout the flowering period, remove the dead flowers, to encourage more blooms. Throughout the season, tie in the strong new stems to the supporting structure such as a wall, arch, pillar; obelisk, or fence. English Country Gardens. We are your local grower of David Austin Roses and are dedicated to helping you achieve a more successful gardening experience.